From Virginia Woolf to DJ Tanner, keeping a diary has long been a rite of passage for girls. 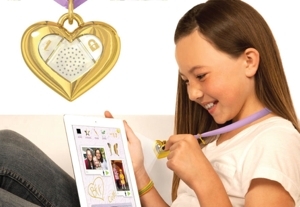 Now, a company named DanoToys is trying to bring the diary into the 21st century with the iHeart Locket, a Bluetooth-powered necklace that unlocks a journaling app for young girls. The Locket itself is a simple piece of wearable technology. It has two buttons: A key, which allows the holder to read and write in the journal; and a lock, which hides all the content from prying brothers and little sisters. It’s a simple, relatively inexpensive way to encourage your daughter (or granddaughter) to get an early start in writing while preserving cherished memories along the way. Of course, a digital diary is capable of capturing much more than just words. Creative kids can fill the virtual pages of their journal with photos, drawings, and audio recordings. The diary app allows you to export pages to an iBook. The iHeart Locket Diary app is currently available for free download on iTunes, though you’ll need to purchase the iHeart Locket to use the app. The Bluetooth locket itself retails for $24.99.